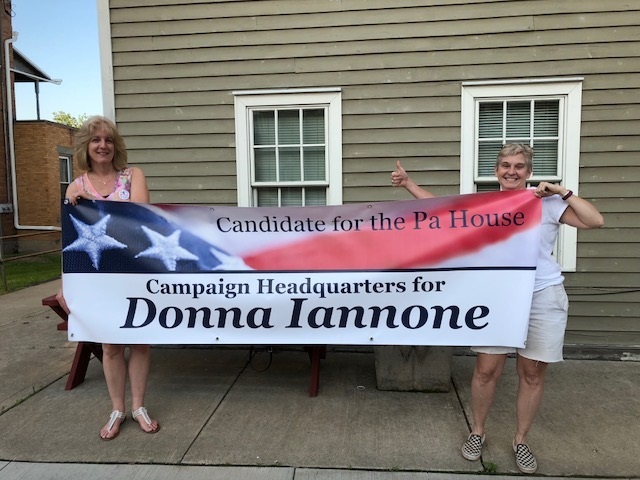 PA House of Representatives District 110 candidate Donna Iannone (above, right with Friends of Donna Iannone campaign treasurer Marge Dailey) will host an open house at her new campaign office in Wyalusing on Friday, June 1 from noon to 7 pm in the Wyalusing Community Building on 20 Main Street, Wyalusing. Pennsylvania’s 110th District includes all of Sullivan County, the majority of Bradford County, and western Susquehanna County. Donna chose Wyalusing to house her campaign headquarters because she felt it necessary to have a more centralized location. This way, most voters who wish to visit won’t have to travel too far. If you’re in the area that day, stop in for snacks and refreshments, and get to know Donna. Campaign materials and tickets for Wyalusing “Rocks” the Vote will also be there. And if visitors are not registered to vote already, they may do so during open house hours. The 110th District serves, Sullivan, majority of Bradford, and Western Susquehanna Counties. For more information, follow Donna Iannone on Facebook and Twitter, email Donna at 110donnapa@gmail.com, or visit www.donnaiannone.com.